Desalination is dedicated to promoting leading edge progress on the globally important topic of water desalting since 1966. It focuses broadly on science and engineering, being both fundamental and applied in motivation, respecting that desalination today is a widely accepted practice by industry and communities, but in need of ongoing innovation at all levels to ensure economic and environmental sustainability. Desalination therefore welcomes submissions detailing work that is clearly connected to water desalting including applications of desalination to seawater, groundwater and waste waters, such as thermal, membrane, sorption and hybrid processes. 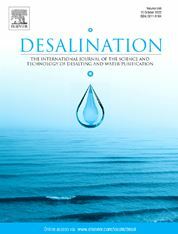 The journal considers articles showing advances in science made on desalination materials, processes and related technologies. Articles can feature transport and process modelling, energy consumption, renewable energy and energy recovery. Topics can also be on related systems such as pre-treatment, post-treatment, integrated plants and brine disposal. Performance aspects are also of interest, for example causes, consequences, and countermeasures of fouling and scaling. Articles presenting interesting technical, economic, and regulatory analyses of full-scale plants will also be considered. Overall, topics of submitted articles are prioritised to those well suited to a journal dedicated to the field of desalination. All submitted articles must predominantly consist of innovative work and original thinking, and present previously unreported outcomes and experiences. A high standard of quality (writing and presentation) is expected for submitted articles commensurate of articles published in leading international journals. Desalination considers submissions as outlined above as Full Text Papers, Short Communications, State-of-the-Art Reviews and Letters to Editors. Prospective Review Authors are requested to contact the Editorial team prior to submission. Short Communications should be concise and not exceed 4-6 printed pages but must include complete descriptions of any investigation of the research which must be cutting-edge and novel with knowledge that warrants speedy communication to the readership.